The first time I tasted this podi in one of our relatives place. When I asked them for the recipe, they said, it was store bought. But, it was like a home made stuff and I loved it. When we left, they gave me a pack of this podi. 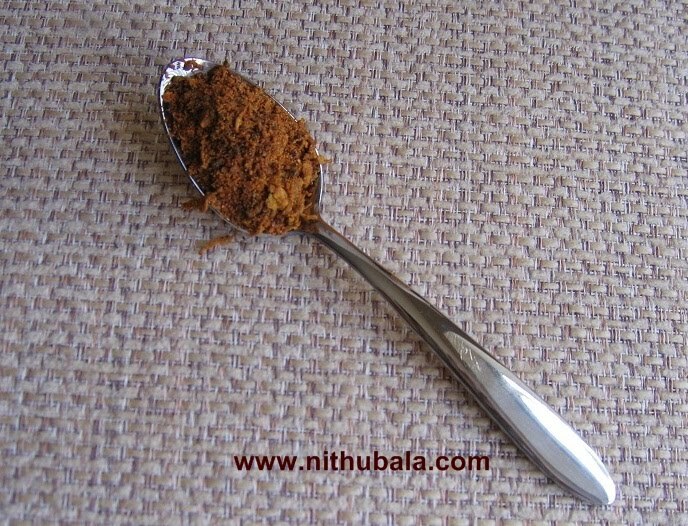 After we finished that pack, I prepared the podi at home and it turned out good. 1. Wash, dry and grate the bitter gourds. (While grating, remove the seeds). 2. Squeeze the bitter gourd well. Spread it on a paper towel and leave it as such for 10 minutes. 3. Now, mix it with a table spoon of yogurt. Keep aside for 30 minutes. Then, squeeze well and keep aside. 4. Meanwhile, dry roast urad dhal, channa dhal, cumin seeds, coriander seeds, tamarind and red chilly. Transfer to mixer jar and let it cool. 6. In a pan, add oil and splutter mustard. Add asafoetida and fry for a second. 7. Now, add the bitter gourd, turmeric powder and salt. Keep frying in low heat for about 15 minutes. 8. Add the ground powder and mix thoroughly. Keep it on a low flame for few minutes. 9. Cool and transfer to an air-tight container. 10. Serve over the hot rice with a dollop of ghee. very new recipe to me.. looks yummy.. Sounds tasty,would definitely prepare it. innovative & healthy !! bookmarked this recipe..
Podi looks so tempting to be eaten with curd rice. Sounds different..a new way of using bitter gourd.yummy!! i love pavakkai and this recipe is bookmarked! very interesting and healthy! Love any kind of podi. This one is very healthy. Never heard of it before. Love to try. Thanks for sharing. Healthy pavakka podi, thanks for sharing..
very new recipe to me.....never tot v cud make this of bitter gourd...Can we have it with idli and dosas. Podi with pavakkai is something new to me! Sounds good Nithu! A must try looks like! Loved this recipe. This is new to me. I never liked bittergourd so never tried cooking it. never had this... sounds really interesting!